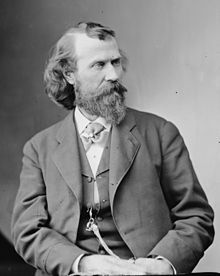 Joaquin Miller (September 8, 1837 – February 17, 1913) was the pen name of the American poet, essayist and fabulist Cincinnatus Heine (or Hiner) Miller. Who now shall accuse and arraign us? What man shall condemn and disown? They were born with Time in advance of Time. Lo, he is the twin-born brother of mine. Lives for the meanest mortal known. God pity us all in our pitiful strife. Shall cast at his fellows a stone. 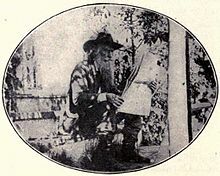 The Danites: and Other Choice Selections from the Writings of Joaquin Miller (1877), p. 52. Yet first to repent and regret! O woman! O beautiful woman! Be then first in the kingdom of God! "For Those Who Fail" in Memorie and Rime (1884), p. 237. O star-built bridge, broad milky way! O star-lit, stately, splendid span! He lives for neither God nor man. The Building of the City Beautiful (1905), Ch. V : How Beautiful!, p. 48. And shake the world, these bits of spray. Gets back its gift in tenfold pay. The rivers run and oceans roll. When reigning as a splendid whole! Bearing his load on the rough road of life? In blackness of heart — that we war to the knife? As quoted in Oh! Downtrodden (1976) by David Zane. Burns and Byron (also known as In Men Whom Men Condemn), p. 175. Lay all the loves of Paradise. No, no, this tale is not of him. Stood king at sea or anywhere. Did seem a walking arsenal. The tall-built, sunburnt men of Mars. . . But what and who was she, the fair? Yet look as looking anywhere? Lay all the loves of Paradise. . . .
And loved and did not blush thereat. And love for love is reckoned best. Where peace hath her abiding place. . . .
Of dead and risen old new Rome. I dared not even dream of that. And made itself a part of this. Their love for light of Paradise. By angels on a stair of stars. Of time's remotest reach or stir. Lo! all things moving must go by. And only God is in the sky. Named day were God's own house. The awful autograph of God. This variant was cited as being in The Ship in the Desert in the 10th edition of Familiar Quotations (1919) by John Bartlett, but this appears to be an incorrect citation of a misquotation first found in The Japanese Letters of Lafcadio Hearn (1910), edited by Elizabeth Bislande, p. 161. Epigraph, Ch. 2 : Twenty Carats Fine. Epigraph, Ch. 3 : Man-Hunters. THERE IS ONLY ONE TO-DAY. A soul that has not learned to read. Dedication to his daughter Jaunita Miller on her 10th birthday, later published as "The Voice of the Dove". Smooth o'er head, and nearest God. With such peaks as know the stars! Woe that passeth ghosts of guilt. Builded singing as I built. Wait your loyal little feet. Till you come are incomplete. You will come my dearest, truest! Flashing up the walls of night! Rhymes of battle for the Right! To touch the God-built stars sublime. The God who called him from the dust. By palm-set land or frozen sea. Behold this sea, that sapphire sky! And hold some higher, holier plan? By outworn book of outworn land? Shall man for God do aught at all? Almost his first words were, "Well, let us go and talk with the poets!" In vain I assured this untamed poet that the "Bards of San Francisco Bay," whom he had so naively saluted, had taken the vows of neither brotherhood nor sisterhood; that they feasted at no common board; flocked not; discoursed with no beaded rills; neither did their skilled hands sweep any strings whatever, and he must, therefore, listen in vain for the seraphic song. Charles Warren Stoddard, on Miller's arrival in San Francisco, in The Poet Of The Sierras, in Overland Monthly Vol. 27 (1896), p. 667.